Diesen FAQ habe ich für das SMS FAQ Completion Project geschrieben. Bitte schau dir auch mal das No-Death Video von IceQueenZero an, du findest es unter dem Walkthrough. :                     :'  '_.._..--'        '   '. .---..-----.                  ' .._   .' '.
.''    |   ()  _|_ .--. .-:   _   | /       \ /   /   /   ''-_  :.--''-. '-:   |          /  '..'   : (_)  |   L.:.   ) <. /      '. .
.'        .---. '''__     _...  /     '.     ' --'._     )      '. '-.__      |  '--'   :    |  '<_.) |.____.' /  |     _:     :'.__.'  . I have implemented a search system into this text file. jump to the desired chapter. Bobble, which is a cool oldscool 8bit game on the Sega Master System. There are not that many choices to make. or continue where you just died. through the 200 levels of Bubble Bobble on the SMS. trapped inside to get rid of the enemy and make some delicious items appear. You shoot the bubbles with Button 1.
are lots of levels with different layouts. side of the screen indicated by the green squares. For 4 bubbles you score 8.000 Points. For 5 bubbles you score 16.000 Points. For 6 bobbles you score 32.000 Points. And finally for 7 bubbles you score a fantastic 64.000 Points. bubbles. See the paragraph just below for more info. 30.000, 100.000, 200.000, 400.000 and 1.000.000 Points. word up to get an extra live. has an opening to the top. at once add to this. which is pretty nice to have. sure and maybe somewhere else too. in 45° angles and kills everything it touches. helping a lot, but you get no bonus for it. them even into items (diamonds) that give you 700P each. touch the flash the die. Your dino is immune to the flash. and you just have to bubble and pop them. Or just touch them, that also works. The blue umbrella lets you skip 3 levels. The red umbrella lets you skip 5 levels. stages and won't kill Baron von Blubba. level and grab everything it touches, be it enemies or your dino. hard to reach places and kill a lot of enemies at once. once this single flame reaches solid ground it unleashes its true power. aggressive. You better finish this level before the next thing happens. the enemies also get a speedboost again. help you to actively get some events to appear and happen. you collect the treasure chest or candy cane item. really random? No, you can make it happen on purpose. still on screen will turn into something nice for you to collect. points each time and you can get to a double number pretty easy. other playerer kills the last enemy. The enemy descriptions are written by BSulpher and used with permission. and walk around. They first appear on stage 1.
robes. These guys first appear on stage 6. These are purple, flying whales that just fly around on a 90 degree angle. they please. They first appear on stage 10.
horizontally while barely moving vertically. They first appear on stage 20.
they can jump through floors. They first appear on stage 30.
first appear in stage 40.
contend with their deadly laser projectiles. They first appear on stage 49.
will have the misfortune of meeting. They first appear in stage 49. *  Make sure to catch the door to the crystal ball room. start your move to the left too. the big mighta. Then hit him ~12 times and he is trapped in a bubble. Pop the bubble and he is gone. After 10 hits he changes color so you know you are nearly done. There is a Hidegon in this room for every Mighta in the Arcade version. crossing the room on ground level you better stay up on this level. make the flashes shoot out pretty fast and hit him 10-11 times. So, you think it's over now? level 100, but not the SMS version. Read on to find out how to continue. 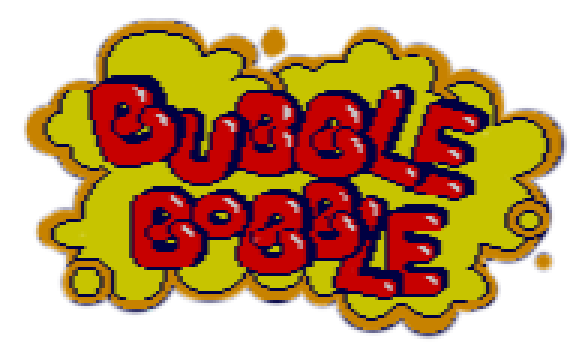 There are 3 different endings to the SMS version of Bubble Bobble. magic balls before you get the bad ending. have to collect the 3 magic balls in level 10, 50 and 90.
level and lead you to the red crystal ball. taken to an important room with the blue crystall ball in it. the green crystall ball in it. you are not able to enter levels higher than 100. And what items do you need to reach the good ending? in the room until the Hurry Up appears. You can trap them in bubbles though. makes them even more evil. levels and get all the other magic items for the good ending. will be right there on levelstart but it is rather fun to reach it. side, then move under the door and jump up to just touch it. is a fun challenge and not as hard as it sounds. it actually is the gate to the blue mirror room. get to the gem rooms) to gather all the points. needed for the best ending. So, what happens in the best ending? *  Make sure to catch the door to the magic key bonus room. *  Make sure to catch the door to the red mirror room. *  Make sure to catch the door to the magic candle room. *  Make sure to catch the door to the blue mirror room. *  Make sure to catch the door to the green mirror room. lot and avoid being hit by the bottle or the superdrunk himself. too and leads you to the first bonus room. give you a lot of points. crystal ball to reach the levels beyond 100.
right there where all the enemies gather, so be careful. In this stage a bonus food item will appear in the top, ab right of the middle. a bit left of the middle. The Bonus room is again filled with 5 chests with lots of fruits. The bonus room is filled with valuable gems again. down there at your starting point. The Bonus room is another gem filled room. The Bonus room is another chest room with lots of fruits. 4th level of floors the door will appear on the 6th level of floors. The Bonus room is a gem filled point grabbing room. The Bonus room is filled with gems for your points. will glide down. Watch out, not to hit one of the Zen-Chans down there. in the level the door appears a bit left of the total middle of the stage. bottom of the level. You can't miss it. The bonus room are a lot of chests with lots of cheap bonus items in it. starts and you just have to jump into it. The bonus room is filled with precious gems and yet another secret code. rather fun to reach it. having to face the 7 Monstas in the room. The room is filled with 37 diamonds and a secret message. work, but the bonus room exits in the game's RAM and is a fruit bonus room. The bonus room is filled with diamonds. The bonus room is filled with lots of diamonds. hidden door in level 179 but there is one leading to a gem filled bonus room. This Bonus Room contains a lot of gems. Good for the next hidden door! teleport to the last level. The door appears a bit to the right of the middle. You can only use one of these cheat codes at a time. version of Bubble Bobble for the SMS. The first version that was uploaded to the interwebs. all and especially old games. Games /         for (re)starting the SMS FAQ Completion Project. a really good CoAdmin for the SMS CP Website. the SMSCP       and all the writers contributing. you             for reading this and enjoying old games. vely written for your personal use only. www.gamefaqs.com  or www.neoseeker.com   please ask me  for permission  before. will act  as stated above.